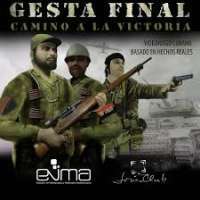 This game was developed in Cuba in the first person shooter style, and is the first 3D game set in the Cuban Revolution. Review historical passages of the armed struggle of the Cuban people in the Sierra Maestra. A very interactive game where users have to go through five levels that correspond to the main moments of the guerrilla struggle that took place between 1956 and 1959 and ensured the triumph of the movement headed by Fidel Castro. The user gets into the skin of the historical figures who starred in those events - Che Guevara, Fidel Castro and Camilo Cienfuegos. Being able to experience the battles then recreated in detail, it's a game quite entertaining and emotional. The five levels are the landing of the yacht Granma, Combate de Alegría de Pío, Combate de La Plata, Combat of El Uvero and El Triunfo. The player has a life bar in the bottom, when it is exhausted the player dies and reappears. The player must also be done with different weapons, to make way to reach these objectives without losing, that is, you will have to kill the enemies ( Batista's army ) to reach the enemy. Once the objectives are completed, the mission ends, in the next one another map, environment and objectives will be assigned. The game contains a wide variety of weaponry from the Cuban Revolution from Tophsom submachine guns to semi-automatic rifles such as the M1-Garand or the M1-Carbine. Each one with their respective names, ammunition and shooting mode. The game is available at various Youth Clubs across Cuba.